Sentex® products are used to secure residential and commercial entries. 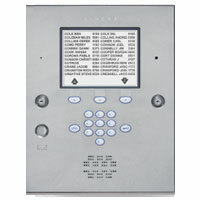 These operators and telephone entry systems are professionally installed by a national authorized dealer network. LiftMaster® is the #1 brand of professionally installed residential garage door openers, commercial door operators and gate operators sold through a network of trained professional dealers worldwide. DoorKing provides a full range of telephone entry systems and accessories to meet your specific application requirements. The 1830 series (1833, 1834, 1835, 1837) are PC programmable systems and include the DoorKing Remote Account Manager and Transaction Analysis software. The 1802, 1803, 1808 and 1810 systems are ideal for basic stand-alone telephone entry control. The 1812, 1816 and 1820 Telephone Intercom Systems provide two-way communication and control of a door or gate through a residents telephones without the need of Central Office phone service. Linear’s Telephone Entry Systems combine telephone entry with full-featured access control, including keyless entry and panic functions. They are extremely easy to operate, making them ideal for a wide range of applications, including apartments, condo complexes, dormitories, parking garages, office buildings, recreational facilities, and gated communities. Linear's Telephone Entry systems offer security, convenience, and handicapped access.